Cystic fibrosis (CF) is an acute hereditary disorder, more common among Caucasian people. In the United States alone, over 30,000 individuals are affected by the disease. In CF, the body produces abnormally viscous secretions that can obstruct lung structures and serve as a medium for potentially severe respiratory tract infections. The thick mucus can also impede pancreatic enzyme function, leading to ineffective digestion and nutrient absorption. Every year, 1,000 new CF diagnoses are made, and for every 3,500 children born, one is diagnosed with CF. A team of scientists from the Czech Republic have created their own version of a mass spectrometer, which has the potential to make the detection of cystic fibrosis (CF) and gastroesophageal reflux disease (GERD) much simpler and less invasive via a breathing test. 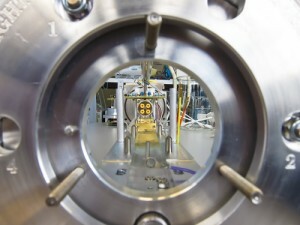 The Czech team, headed by Patrik Španěl, claims that their breakthrough mass spectrometer has the ability to determine the presence of CF from analyzing concentrations of hydrogen cyanide in an individual’s breath — a much more convenient approach compared to the traditional method of obtaining mucus specimens from the patient’s throat. Španěl’s associates Kseniya Dryahina and Violetta Shestivska of the Heyrovsky Institute of Physical Chemistry of the Czech Academy of Sciences, helped in the discovery of this new procedure. They had also partnered with National Institute of Public Health and the Prague-Motol Teaching Hospital in this endeavor. Earlier in 2006, Španěl – despite initially specializing in ionic and molecular reactions in interstellar space — was awarded a local research grant to study diagnosing infections using a breathing test. This preliminary experience and knowledge on breath testing for the purpose of detecting disease aided Španěl and his team’s new method, which apparently can also be used to diagnose GERD — a disorder that almost 1 million Czech Republic citizens suffer from. There is also a strong belief that the technology will continue to be expandable into detecting other diseases via breath tests as well. Currently, the new diagnostic is undergoing tests for its effectiveness in diagnosing an inflammatory bowel disease (IBD).